Posted by M Bharath Bhushan in ecology, Economy, Identity, Karimnagar, livelihoods, Mahabubnagar, Medak, Nizamabad, suicide, Telangana. At least 207 farmers have committed suicide in Telangana in the last four months, according to Rythu Swarajya Vedika, an umbrella group of voluntary organisations working on farmers’ issues. The situation is grim in Warangal where 52 farmers allegedly committed suicide, followed by 35 in Medak, 31 in Adilabad, 28 in Nalgonda, 27 in Karimnagar and 18 in Mahbubnagar. Inadequate rainfall, dry bore wells, depletion of ground water and scarce irrigation facilities leading to general crop failure have been cited as the reasons that forced these farmers to end their lives. Posted by M Bharath Bhushan in Adilabad, corruption, Karimnagar, Medak, Nizamabad, Telangana, TRS. Hyderabad: The ambitious Haritha Haaram project of the Telangana State government to improve greenery in all the 10 districts by planting over 230 crore saplings in three years has hit a roadblock. Tenders being called to procure crores of polythene covers to supply the saplings have become controversial with contractors forming syndicates to bag the contracts for higher prices. Posted by M Bharath Bhushan in ecology, Economy, Karimnagar, landuse, livelihoods, Telangana. Two debt-ridden farmers allegedly committed suicide in Karimnagar district of Telangana, after they suffered huge losses due to crop failure, police said on Monday. Posted by M Bharath Bhushan in Culture, Dasara, Hyderabad, Telangana, Telangana Festivals, Telugu. It provided a window to Telangana traditions. 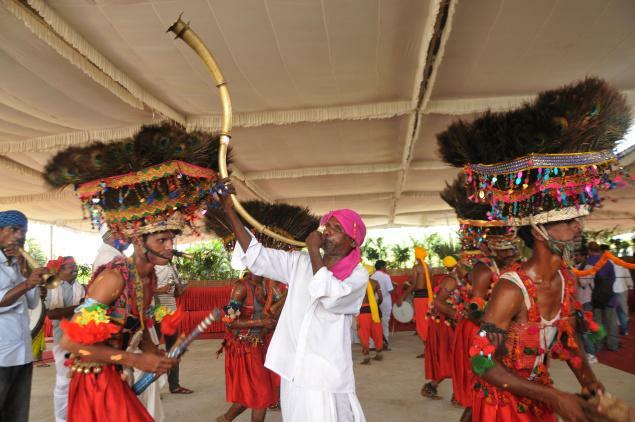 The sprawling Jal Vihar on Necklace Road presented the typical rural ambience of Telangana as the ‘Alai-Balai’ cultural fete was organised on Sunday. On display were both the culture and cuisine of Telangana. Posted by Telangana Utsav in Essays. The festivities had it all: thousands of women from different parts of the state dressed in their best, cultural troupes presenting quick demonstrations of dances and songs, a laser show projecting Bathukamma in the dark sky and finally a firework display that went on for a good 20 minutes. The newest state in the country, Telangana, announced its arrival on the scene with the spectacular celebration of Saddula Bathukamma here on Thursday. 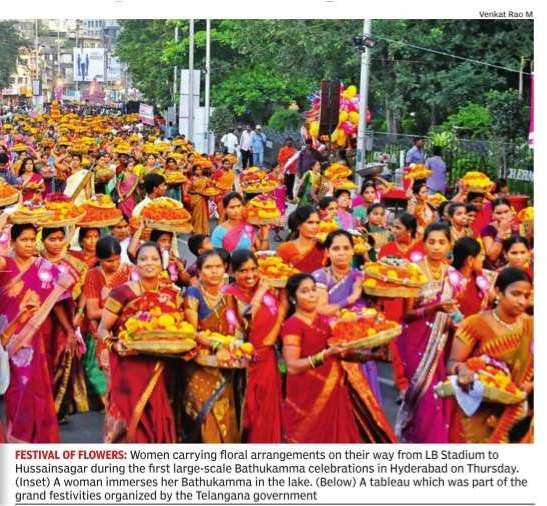 Once a festival celebrated in villages and small towns by small groups of women, Bathukamma was literally hauled into the mainstream consciousness of the state by chief minister K Chandrasekhar Rao, whose government declared it a state festival and promised to put on a show in the city unlike any other before. And on Thursday, the chief minister, with governor ESL Narasimhan and countless other VIPs in attendance, witnessed the celebrations surrounded by a sea of humanity. The festivities had it all: thousands of women from different parts of the state dressed in their best, cultural troupes presenting quick demonstrations of dances and songs, a laser show projecting Bathukamma in the dark sky and finally a firework display that went on for a good 20 minutes. The celebrations began in the morning at the Lal Bahadur Stadium, where the government had arranged for the delivery of 30 tonnes of fresh flowers, which the women used to make Bathukammas un der temporary shelters.Around 4 pm, the women carrying Bathukammas proceeded to Hussainsagar.The procession was interspersed by demonstrations of dance and music by cultural troupes reflecting the various cultural aspects of Telangana such as Perini Sivatandavam and Oggu Kathalu. Flower-decked tableaux representing the important aspects of the 10 districts were also wound their way slowly on the route. The celebrations were telecast live on many TV channels and the state govern ment’s dedicated website for the festival had live streaming of the f e s tivities. With the government sanction ing Rs 15 crore for the conduct of the festival, the officials has also installed several CCTV cameras all along the route from Lal Bahadur Stadium to Hussainsagar and monitored the feed continuously to keep a watch over any potential law and order situation. The people went into a frenzy when Chandrasekhar Rao and governor Narasimhan made their way on to the dais set up near Rotary Park at Tank Bund. The area was cordoned off for traffic and a few low-flying drones overhead grabbed everyone’s attention. The government also ensured the presence of a large number of life guards as the festivities ended with the women releasing the Bathukammas in the water.Even as night was falling, a laser show lit up the skies followed by the long fireworks display, which was hailed by loud cheers from the people, and brought the curtains down on the festivities. 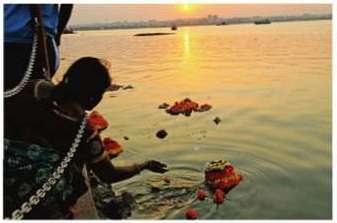 For those who couldn’t make it Hussainsagar, the Greater Hyderabad Municipal Corporation (GHMC) had taken up civic works at 18 smaller water bodies so that women could celebrate the festival there as well.